I had seen MH long long ago, and considered it at the time an arbitrary and pretentious movie whose critical acclaim hinged solely on its being made by David Lynch. The blu-ray was therefore an experiment in re-evaluation, to see if I had by chance missed the significance of the film. Turns out, I had. I am still not ready to list this among my favorite films, but there's definitely a twisted dream logic to the proceedings that unlocks along with the opening of the MacGuffin blue box in the film. I cannot describe the film in great detail here for fear of spoiling it for people that have not yet seen it, but it starts off as a neo-noir mystery thriller centered on the two female leads (Naomi Watts and Laura Harring, both smoldering) with what seem like barely connected detours featuring other characters and situations, but in the last 15-20 min of the film, Lynch pulls off a coup of reversal that has you rethinking on all you have previously seen. And I imagine this will induce greater re-watchability to the film even if some individual events (the diner episode and the espresso episode in particular) still seem contrived in their weirdness. It helps to know that some of the feeling of disconnect and paucity of character development possibly stems from the fact that MH was first developed as a TV series, and after the studio developed cold feet over the pilot, re-purposed with additional funding from Studio Canal as a standalone feature film. Lynch is not apologetic over the loose ends because as he proposes, dreams have lots of loose and dead ends, and the film operates on a dream logic. Studio Canal's blu-ray gives a solid presentation. The video has some significant amount of manipulation in terms of light exposure and softness so it's not reference material, but generally looks very good and assumedly faithful to the director's intentions. 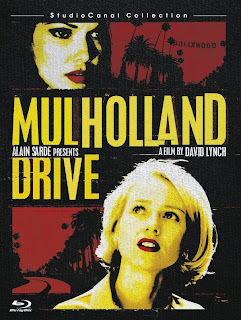 The soundtrack is quite brilliant, both in terms of sound effects and Angelo Badalamenti's atmospheric score. I am a little annoyed about the lack of English subs on this release because one problem is that the dynamic range of the audio is VERY HIGH, meaning it can go from barely audible whispers to room rocking crash-bangs, making it necessary to adjust the volume during playback, not convenient. There are a bunch of extras, with behind-the-scenes footage during the shoot, as well as various film-makers waxing on the greatness and importance of MH (* These extras are present on the digibook release of the film, but may have been removed from the armaray case re-issue).